As passionate chocolatiers, we’re always on the lookout for new exciting “couvertures” to try ~ “What’s a couverture” I hear you cry, “be gone with your fancy words!”. Couverture (from the French for “covering”) is high quality chocolate that contains extra cocoa butter. It is a legal definition, meaning that a chocolate must have at least 30% cocoa butter to be called a couverture….so all couverture is chocolate, but not all chocolate is couverture! Are you following..sit up at the back! Cocoa butter is responsible for the “snap” of a well made chocolate bar and also for the ability of chocolate to melt so seductively at body temperature. The more cocoa butter chocolate has, the more fluid it is when melted and tempered which makes couverture the best choice for producing a delicate, shiny shell on pralines, ganaches and desserts. Cocoa butter is a valuable commodity so cheap chocolate manufacturers replace some of the cocoa butter in their products with other fats – namely butterfat and palm oil. This is why cheap chocolate a) tastes horrible b) sticks to your mouth instead of melting and c) forms a solid gloopy lump when you try to melt it for brownies. So there you have it, a clutch of facts about cocoa butter and couverture. Pop back for my next post about our new house dark couverture made with the wonderful Robert Chocolaterie 100% cocoa mass from Madagascar. 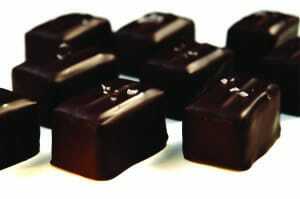 This entry was posted in Blog, Chocolate Information and tagged chocolate, cocoabutter, couverture, quality chocolate.